Abu Dhabi’s Etihad Airways has denied violating takeover rules while buying a 24 per cent stake in Naresh Goyal’s Jet Airways. In a reply to the Securities and Exchange Board of India (Sebi), the foreign airline has said it is not liable to make an open offer for the public holding in Jet as there has been no violation of the takeover code. Etihad’s main contention is the deal was cleared by both the securities market regulator and the Competition Commission of India before it was served a notice by Sebi in February. The airline had to reply to the notice within 21 days, failing which it could be asked to make an open offer. The Abu Dhabi-based airline, in its reply, is believed to have said the anti-trust watchdog--which observed that Etihad would get joint control in Jet Airways — had examined the deal purely from a competition law perspective and not through the prism of the Companies Act or the Sebi’s takeover code. Sebi and Etihad did not respond to this newspaper’s queries on the matter. 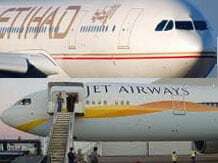 Last December, Etihad and Jet Airways had appealed to the Competition Commission to review its observation but the plea was rejected. In a communication to the ministry of finance in September, Sebi stated the agreement between Jet Airways and Etihad did not result in change of control. However, the market regulator had put in a caveat that if any other regulator took the view that Etihad was gaining control over Jet Airways, the two airlines would be deemed to be “persons acting in concert”. Sebi’s notice might have been influenced by the Competition Commission’s observation on the deal. According to the takeover code, an open offer can be triggered if an entity acquires “control” over a listed company. “Control is a subjective issue. A fresh view has come Sebi's way. The regulator will definitely act on this,” said Pavan Kumar Vijay, managing director & founder, Corporate Professionals, a consultancy firm.